Hiding Tooltips in the Editor. A feature new to MacVector 12 is the ability to both annotate and display features directly in the Editor, without having to open a separate Map view window. There are also tooltips that show the feature on the sequence directly under the mouse cursor. 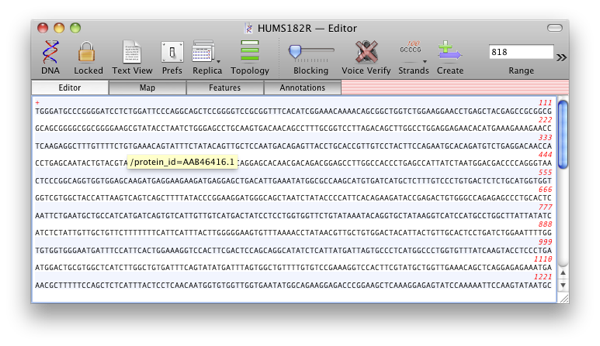 For example in the following screenshot you see the ID of a CDS feature annotated on the sequence. Sometimes this can obscure the sequence underneath, so press the “Escape” key to hide the popup.